In this Guitar control lesson video, Instructor John Maclennan is going to show you how to play Hey Joe on guitar for beginners. I always think that anytime you are able to learn a song by a guitar hero as a beginner, it is really encouraging. It’s nice to know that even the greats enjoy the beauty the simple riffs and licks can have, and that things don’t always have to be hard and complicated to be great. That good is just good and the song comes first. If it calls for something crazy, then do it, if simple sounds better, then keep it simple. The song is always first. In this lesson John is going to breakdown some classic Hendrix licks that even beginners can do! All licks of course, from Hey Joe. This is one of the few Hendrix songs that Jimi actually plays in standard tuning, most of his songs tend to be in Eb, so all down a half step. We are going to cover a ton of cool licks from this classic song all in the E minor pentatonic scale around the 12th fret…a lot of careers exist from just knowing just this scale in this position, and who better to learn from how to solo in it, than arguably the greatest guitarist of all time, Jimi Hendrix. Step one in learning how to play Hey Joe on guitar for beginners is learning the first phrase! The first bend is on the 15th fret of the 2nd string. You bend up one full step, using your third finger with tons of vibrato, of course, because this is a Hendrix tune and his playing is all about feel and emotion. Then you play the same note you just bent to, an E, but now on the 12th fret of the 1st string and just picking it once. Then you descend the pentatonic scale, starting at the 15th fret 2nd string to the 12th 2nd string, to the 14th fret 3rd string. On the 14th fret you go straight into a full step bend, you bend and release, so you bring your bend up and back down, then pull off to the 12th fret 3rd string. Hear John put this all together at the 1:11 minute mark. After all of that you are going to add two more notes. The 14th fret 4th string with your ring finger and the 12th fret 3rd string with your pointer finger, just picking both of those once. See 1:27 to hear all of that! And that is the first phrase, all out of your E minor pentatonic scale. Basically this is just kind of a blues. Hendrix was a great blues player. If you are enjoying learning these simple but classic Hendrix licks, be sure to also check out our other lesson video for how to play the solo to You Shook Me All Night Long by AC/DC for another simple lead from another guitar hero. For phrase two you are going to return to 15th fret 2nd string bending it with your third finger again. So you are actually almost going to play the whole first phrase again. After the bend you descend down the pentatonic scale again, starting at the 15th fret 2nd string with your pinky finger to the 12th fret 2nd string with your pointer, right into a bend on the 14th fret 3rd string. The difference though this time, is we are going to have a slightly different ending. This is a really basic and popular way to actually right a solo, and a very good and effective way. To play a lick, then play part of it again with a variation. So building and playing off a theme. Listeners are attracted to this since they recognize a phrase. A very good way to try and write your own solos and to start to understand and set a roadmap for yourself to writing and telling a story on the guitar with a solo. Almost like a conversation. So everything is the same all the way up to when we bend the 14th fret 3rd string. But here is where it changes, you don’t bend release and pull off to the 12th fret this time. This time you use your pointer finger to play the 12th fret 2nd string while you are still bending the 14th fret 3rd string with your ring finger. Then pick the string that is still bent and bring it back down to the natural 14, so the 14th fret 3rd string as is, no longer bent. Then also on the 3rd string, pick the 12th fret and then hammer on to the 14th fret, then pull off back to the 12th fret. When you get back to the 12th fret you push it up slightly, doing a blues bend. Then resolve on the E note on the 14th fret, 3rd string with lots of vibrato of course! Hear John play the second phrase at 2:52 minute mark. Then at the 3:09 mark hear him put both phrases together. Then after all that John plays the same little ending he did on phrase one, where he picks the 12th fret 3rd string with his pointer, to the 14th fret 4th string with his ring finger, back to the 12th fret 3rd string with his pointer, but this time he uses a double stop on the 12th fret. So each time he plays the 12th fret 3rd string, he is actually barring both the 3rd and 2nd strings on the 12th fret. So double stop on the 12th fret 3rd and 2nd strings, barring both with his pointer finger, to the 14th fret 3rd string with his ring finger, back to the 12th fret barring the 3rd and 2nd strings. For our last lick you are going to start by sliding into the 14th fret 5th string with your ring finger, and then just walking up the pentatonic scale. So picking the 12th fret 4th string holding it down with your pointer finger, to the 14th fret 4th string with your ring finger, to the 12th fret 3rd string with your pointer finger. On the 12th fret 3rd string he goes a double stop and pulls it up slightly, giving it a blues bend. So on the 12th fret you are actually going to hold down both the 3rd and 2nd strings with your pointer finger. End back on the 14th fret 4th string with your ring finger and tons of vibrato. And then right back to the start bringing back phrase one and playing everything all the way through! And that is today’s lesson! 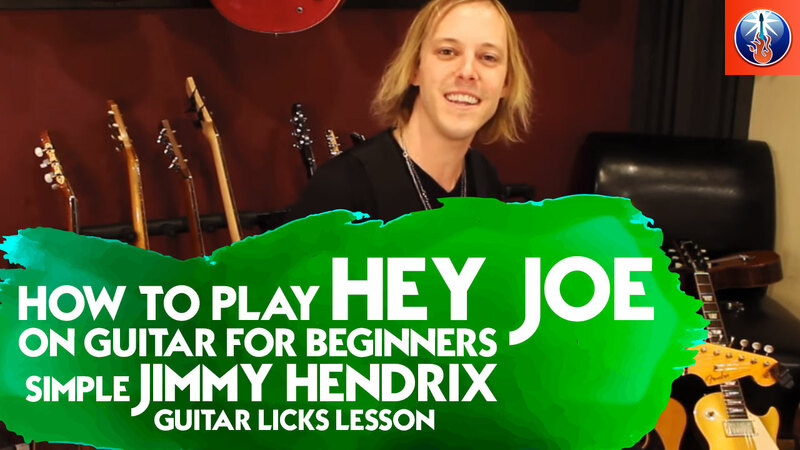 I hope you enjoyed learning how to play Hey Joe on guitar for beginners! John covered some of the most classic licks from this song, be sure to practice this over and over, master them and then add them to your bag of tricks. And if you want to take it a step further, add your own twists and special flares to make these licks your own! Come up with your own variations and take different touches he did and add them to other licks you know, have written, or make up right now! And of course, as always, have fun!